It only pays part attention to the in-built multi-card reader. 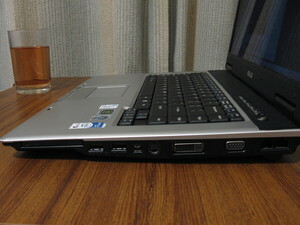 Failures when suspending or hibernating the laptop (later resolved). The sound is incredibly tinny, like hearing someone near you listening to their walkman with the headphones volume up far too loud. But, sounds reasonably fine when you plug in headphones. It's fine for hearing things like system warning noises, but not really any good for listening to music or watching movies. The only way around this is to use something other than the in-built speakers, which is not too practical. I'm not too bothered about plugging an external computer monitor in, perhaps I might like to plug into a projector if I were making a presentation. And I would like to be able to use the S-Video socket, I had no luck using it with the S-Video to composite video adaptor that came with the laptop (Windows and Linux wouldn't find any monitor attached, and not let you attempt to insist that there was really one, even if it couldn't detect it), but it did work when I connected one of my own S-Video cables to the connector. That's okay for some circumstances, but it would be useful to be able to use composite video for situations that you don't have any other alternative. Probably not quite as robust as you'd hope for, considering the cost of buying a laptop. Like many laptops, there isn't really a good way to carry it without an additional bag; you're stuck with tucking it under your arm like an expensive folder. There's no handle, and you'd want to be cautious about which parts of the casing you take a firm grip on. 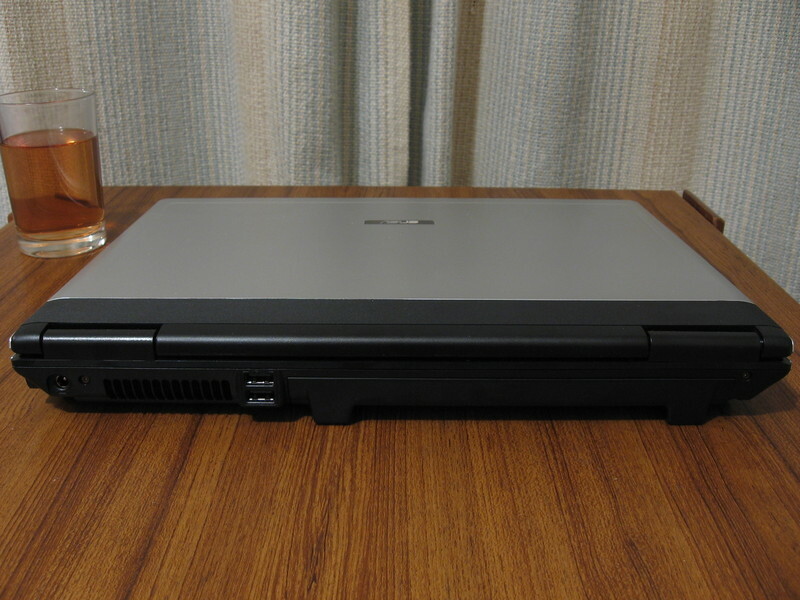 Overall, I would say the old Thinkpads were more robust, they had a lid that was more rigid, as well as the rest of the body. And, I'm not sure it'd be good to actually use it on your lap, as you cover up one or two of the ventilation grilles on the bottom, with your legs. I really dislike how the keyboards are set far back from the front, you have to reach over the front to type, and the distance is just right that my shirt sleeves keep catching on the corners of the casing, prevent me from reaching all the keys. 1.73 GHz Intel Core 2 Duo T5200 CPU A “Centrino Duo” processor which actually has two CPUs in the one physical device. Both processors are apparently used by the system, according to the output of “top”. The information in /proc/cpuinfo indicates that it's 1.6 GHz. 1 gig of RAM Installed in one of the two slots, supports a maximum of 1 gig per slot, and 2 gigs in total. Works fine with the open-source nv driver, also with the nVidia closed source driver packages from Livna (“kmod-nvidia-100.14.19-1.2.6.22.9_91.fc7.i686”, “livna-config-display-0.0.17-1.lvn7.noarch” & “xorg-x11-drv-nvidia-100.14.19-2.lvn7.i386”). In both cases it self-configured, correctly; I didn't have to do anything. It has some dedicated memory, and shares some of the main system memory. The Xorg log with the nv driver has 131 megabytes lised for “VideoRAM”, that about the same as I've seen elsewhere (128 megabytes dedicated RAM as part of the video card, and it'll use up to 255 megs from the system memory, as well). The Xorg log with the nvidia driver has 524 megabytes logged in it, and the nVidia X server settings tool shows 512 MB, yet the output from top doesn't show that much taken away from the total memory pool (either amount). Fedora 7's desktop effects work with the nvidia driver, the nv driver isn't good enough for that. Google Earth runs fine, as does Stellarium, I don't really have anything else installed to test the grunt of the nvidia driver with, at this time. Powermanga is about the extent of my gaming abilities and interests, and for what it's worth, that plays rather nicely. Whilst using the closed-source driver, I did have a play around with some of the multi-monitor options, using the nVidia tool (the system-config-display X configuration thing managed to lock up the computer from the configuration file it produced), and did get separate X servers per display, and monitor-spanning Xinerama, displays to work. Though, messing with the screen switching hotkeys (Fn plus F7 and/or F8 keys), I managed to crash the system (it went straight into a reboot). When using the nv open-source video driver, it locks up if you try to wake up from use of sleep/suspend-to-ram, though hibernating does work. Both modes seem to work with the closed-source nvidia driver, but now the hibernate takes longer to go into hibernation and wake up, and shows various corrupted screens during the lengthier process that makes you thinks it's not going to work, and it didn't want to wake up from suspend to RAM if left for a while (it started to do something, then just gets stuck in an unworkable state—later on, this problem appears to be fixed). Using the open-source nv driver, connecting an external monitor ended up with scrambled video on one or both monitors, as you play with the hotkeys (Fn plus F7 and/or F8 keys) for selecting one or the other. But, seems to work fine when using the closed-source nVidia driver (both monitors showing the same images, either simultaneously, or alternatively using one monitor or the other). It has a 1200 × 800 pixel glossy screen, but not as badly reflective as some that I've seen, but still enough to be annoying when you're trying to look through reflections to what you actually want to see. It's not covered with an extra protective plastic panel, so those who poke screens with fingers, keys, pens, and whatnot, can do far more damage than just marking the screen. The lid doesn't seem very robust against twists, tortion while opening and closing, nor pressure on the top. I'd suggest you handle it with the care you should afford to something that you've paid a lot of money for. WXGA dimensions are rather awful for using a computer. While a wide screen may be nice for viewing photos or movies, the actual pixel count is rather low. This means that any GUI buttons will be rather large. Likewise, the text will also be large, if you need it to be clearly legible. And the canvas size of the windows will be proportionally small, as a result. i.e. When using the common three-pane view in an e-mail client, you have a through-a-keyhole view of the message and message lists. A higher resolution, non-widescreen screen, would actually be better. Most GUIs are designed to take advantage of the screen (pixel-count) height, not width. Like many LCD panels, the viewing angle is quite narrow—both horizontally and vertically—and you can see a shading effect vertically unless viewed from a distance that's really too far away to use a laptop from. This inconsistency, and lack of any determinable correct viewing position, makes LCD screens very bad for tweaking photographs—it's very hard to tell whether you're compensating for your monitor, or correcting the photo. The option to blank the display when closing the lid works, and un-blanks when opened again (you'll have to enter your password, to carry on and use the computer, if that's how your screensaver options are set). DVI monitor output I can't test this, I don't know anyone with a monitor using that connection. SVGA-style 15-pin output I had problems testing this (getting scrambled graphics, needed a reboot to recover) with the open-source nv driver, and things mostly worked with the closed source nvidia driver. S-Video output Works, with a bit of jiggery pokery using the “nVidia Display Settings” system tool that came with the closed-source nvidia driver (from Livna), but I cannot get this to work with the S-Video to RCA adaptor that came with the laptop, even on the original Windows Vista installation. Built into the top of the monitor, didn't appear to be usable by anything, or even noticed as part of the hardware. I did try it out using Windows, and it was about as bad as any other cheap webcam that I've seen (low resolution, grainy), and it's aimed a bit too high for when you angle the screen at the right angle for reading it. According to Windows, it's an USB device. Addendum: Later testing with Ubuntu, then Fedora 9, the camera works. The camera is by Syntek Semiconductor Co., Ltd.
Sound inputs Has only a microphone input socket in the centre of the front panel (a great place to get broken), and a microphone built into the top of the screen, there no other inputs. You'd need an external sound card if you wanted to record something else. And you'd probably want to use something else to capture sound, anyway. Both microphones are as deaf as a post, even with full boost. As well as being very noisy, even when not boosted. And the DC offset of the audio signal goes up as you turn up the audio gain. Sound outputs Has tiny internal speakers, and one combination headphones/SPDIF socket in the centre of the front panel (a great place to get broken). The speaker output volume is quiet quiet, you won't be rocking along to your music collection. And when you play back from a low-level sources, such as most DVDs, it's really too quiet. Works fine at 100 MB/s, I can't test at the other speeds. Uses a Realtek RTL8111/8168B PCI Express Gigabit Ethernet controller. Worked fine out of the box (my Fedora installation was done with the default choices, I didn't add anything for networking), all I had to do was basic network configuration (pick the encryption scheme, enter the credentials, etc. ), I didn't have to mess with drivers. The status LED on the front panel doesn't work, though you don't need it, since you have task bar applets with status indicators. Works though Fedora 7 is awkward to get Bluetooth working. Not tested. I gather it's a software modem, and I don't fancy my chances at getting that to work (brief experiments didn't find a modem to even attempt to configure). Not to mention that I only have a dial-up ISP as an expensive back-up alternative to my ADSL ISP. Four USB 2.0 ports Works fine, tested with a mouse, keyboard, flashdrive, and a hard drive in an external enclosure. All I did was plug them in and use them, no configuring involved. There's two ports on the rear, where you have to be careful to not break something by picking up the laptop and leaning it back at the same time. 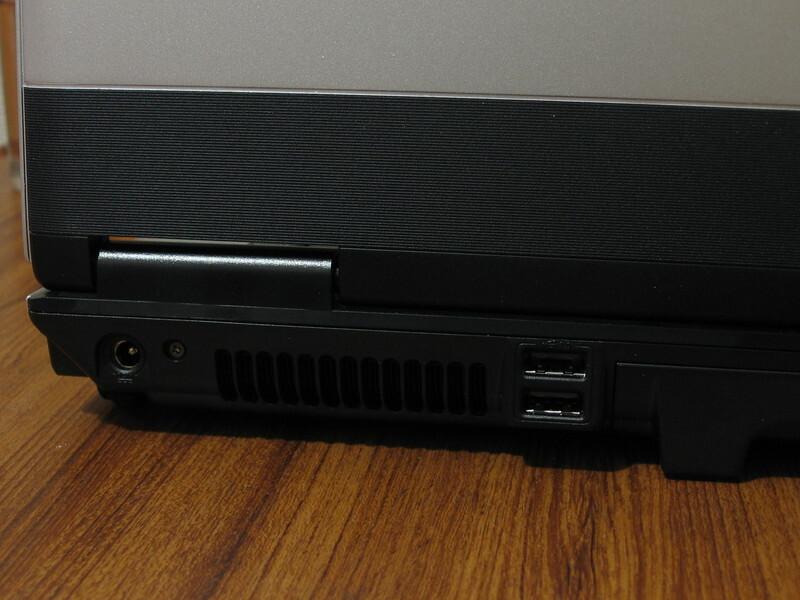 And two ports on the right hand side, sticking out where you'd be moving your mouse about. I couldn't do anything with it when I borrowed someone's video camera with a firewire connection. Some level of hardware was detected, but that was all. ExpressCard slot I can't test this. Directly supports SD & MMC cards, and can support various incarnations of MS cards via an adaptor (which they don't supply). Uses the PCI bus. When I first tried, Fedora 7 couldn't read the SD or MMC cards that I have, though it could read them with an external USB-connected multicard reader. But later on (with software updates installed around the end of October, 2007), I've found that I can read SD cards, but still can't read MMC cards. I've done no configuring to support them, it's been a case of plug them in and make use of them, or not. Internal dual-layer DVD burner I successfully used to the burner to write a DVD+R and CD-R, from ISO files, while using the Fedora 7 Live disc running from RAM. And, after installing Fedora, I have successfully written a CD-R using individual files, and a DVD-R from an ISO file, from the installed OS. In all of those tests, I used Nautilus as the user-interface to write the disc. It was fast enough at writing discs (approx 15 minutes to write a single-layer disc), but tediously slow at reading them (approx 30 minutes to read a single layer disc). 120 gig, 5400 RPM HDD Some on-line vendor specs listed it as SATA, but the BIOS has only PATA type of entries, though the code read from the drive (HTS541612J9SA00) is one for a Hitachi SATA (confirmed by disassembly). Came with a 5 gig recovery partition, 67 gig Windows partition, and an empty 40 gig partition (that was where I installed Fedora onto, further sub-partitioning it). 19 Volts DC power input Socket on the rear panel (makes it easier to break than a side-mounted one, but it connects solidly, has a right-angle plug, and power can be connected and disconnected while running off the battery (whether that be pulling the plug, or simply losing power while still connected). 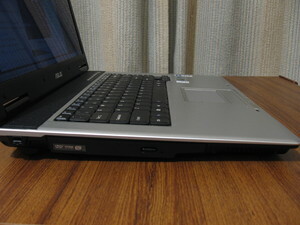 The computer carries on working fine, without any problems if the main power comes and goes, just like using an UPS. A bit under three hours of use, a bit over half that time to recharge. Fedora abruptly died when the battery died. Despite being able to monitor the battery status (the icon that shows up in the notification area, provided by the power manager), and warn you that you're running out of charge, it didn't automatically shut down or hibernate as my on-battery-power power-manager preferences dictated. You have to remember what the front panel battery status light means (on/off/blinking for charging/charged-or-flat/almost flat). The estimation of how long to finish charging the battery, as shown by the power manager, is about as accurate as any computer estimate of time to completion. Addendum: Later on—but I don't recall when the change happened, and I'm now running Fedora 9—Fedora does automatically go into hibernation before the battery dies, as per my prefences (set with Gnome Power Manager). Keyboard Almost complete, reasonably well arranged, but doesn't have the helpful gaps between the function keys, the ins, del, home, end, and page up & down keys aren't in the traditional places (which takes some getting used to), and it doesn't have a second Windows key. I map the right Windows key as the compose key, on my desktop PCs (for typing characters and symbols that don't have their own keys). Now I have to lose another key, that I'd rather keep, to do that function (e.g. the right control key). Some special keys work (display brightness, power, LCD, LCD/external monitor). Works well, better than it did in Windows. Though I haven't gotten around to tweaking the configuration options that allow the touchpad to be ignored while in the middle of typing (accidental contact with it can have surprise effects). The package also included a small USB mouse. Was badged as “Vista Ready” and came with Windows Vista Premium. I made the system dual-boot, keeping what I've paid for, and so I can use the other bits of the hardware if I want to. Windows isn't my default boot option, though. I've never been keen on it, and after a few hours playing with Vista, I've come to the conclusion that it's not getting much better at being user-friendly. For example, the steps I had to go through, using the GUI just to find out what IP address I had been assigned were ridiculous. Never mind that they're still just dumping everything, uncategorised, into the programs section of the start menu. And, now, unlike 2000 or XP, I found it impossible to log in as an admin, and re-arrange the start menus for all users into something sensible, with one simple step. And then there's all the reboots that will happen during and after updates, making it nearly impossible to do things at the same time as updating the computer. Included bits Printed manual (mostly Windows-oriented, rather than to do with the laptop hardware). Phone cable for the modem. S-Video to RCA connector adaptor flylead. Small USB, three button with scroll wheel, Logitech mouse. Microsoft Works 8.5 discs, Nero OEM disc, Asus recovery disc (Vista re-install disc), Asus support disc (drivers and software). 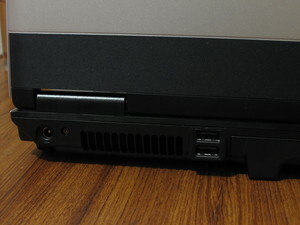 USB digital television receiver, with small antenna, external antenna socket, and software disc. And, of course, a battery and power supply. I spent a few hours playing around with Windows Vista, seeing what was where, turning off stupid features in preparation for a day that I might have to use it in an environment that I don't really trust. I found it quite an annoying ordeal. I spent less time playing with a Fedora 7 Live disc, where you can try it out without installing. Most things went fine, but I've found that systems run from the live discs can sometimes grind to a halt (as it did for me), even when you're running them from RAM rather than directly from the disc. So don't dismiss a system just because the live disc didn't work brilliantly. During this live-disc playtime, I used GParted to repartition the drive, removing the spare partition, and creating Linux ones in its place. I installed using the rescue disc and the ISO file of the DVD on an external hard drive connected via USB. I chose this method simply because I've found it faster to not install from optical mediums, they're none too fast on finding files on the disc, nor with the overall transfer rate. This method takes about fifteen minutes to complete. All I had to do was boot from the disc, pick the location to find the install ISO, select where I wanted things installed, and let it rip. I went with the default options, I didn't have to do anything special to suit this hardware. I'd already pre-partitioned the hard drive, and I picked the custom drive partitioning during the install routine so I could select to install onto those partitions. Post-install boot-up went fine, I answered a few set-up questions, and a minute or so later was using a fully working system. Then I added a few more packages, and did a yum update, simply to bring everything else up to update. My laptop was going to be dual-booting, I left the original Windows partition alone, installed Fedora 7 Linux into the spare one, installed GRUB so it re-wrote the MBR, using it as my boot menu. This all went well, with Windows none the worse for it, with neither OS causing any problems for the other. I do find Windows to be a pain, and Vista's no better than prior releases. It's disobedient, secretive, and blackmailing. But I've paid for it, so I might as well keep it, and there's things that often insist on Windows. Later, I might shrink its partition down, and give myself some more drive space for Fedora. I've only done the tiniest bit of testing with Ubuntu, as I don't use it. But a friend of mine does, so while having a disc to hand I thought I'd give it a bash. This is a very brief set of notes regarding that. 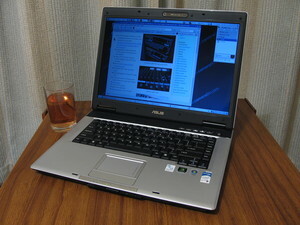 Running the live disc was painless (7.10, desktop edition for a standard personal computer). After trying the live disc, the install went off without a hitch (the install being started from within a live session). I'd already set aside some free drive space, and manually opted to use that during the install, so I don't know how well the automatic options worked. It re-made my swap space (losing the pre-existing partition label), leaving Fedora without a swap space. So I remade my swap partition (from within Ubuntu), giving it back the label that it used to have, and wrote the new UUID into Ubuntu's /etc/fstab file. Now they can both use the same swap partition. Ubuntu wouldn't wake up from suspend, and I've had similar experiences with Fedora. Ubuntu simply booted up as normal if I tried to resume from hibernation. It managed installing NVidia display drivers for me when I turned on desktop effects. It played videos and music fine, though the volume controls show a line-input controller, and there is no line-input. I had a bit of grief with DCHP, but I'm unsure if that was due to booting Windows beforehand. I couldn't test wireless networking. It read a plugged in USB flash drive, handled automatically. It can read SD cards in the internal reader, automatically, but ignored my MMC card. It ran at the top CPU speed, it refused to slow down. You can click on any of the following pictures to see a larger version of them. The screen isn't blue like this, it's the same as other screens. The picture was taken in mixed lighting conditions. 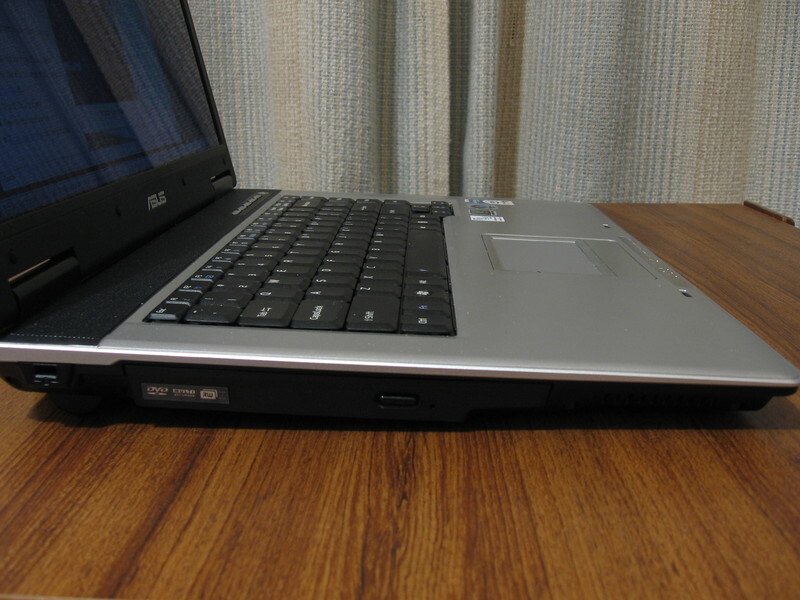 Express card slot, Two USB ports, a Firewire port, a DVI port, SVGA, modem phone line port, and ethernet port. Kensington locking hole point, DVD writer, and ventilation grille. Power socket, ventilation grille, and two USB ports. Same as previous picture, plus the back of the battery (most of the rest of the back panel area, bottom half). Wireless on/off switch, lid open button, microphone input socket, headphone/SPDIF output socket. 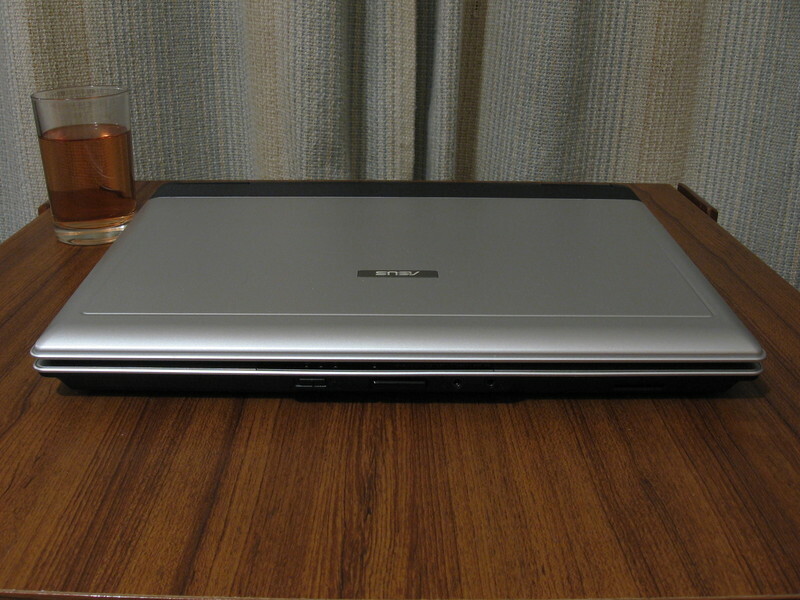 The laptop was bought, and written about, at the start of October, 2007. This page might change a fair bit in the initial stages, close to that date. I've managed to get a few things to work, that wouldn't, at first, with bit more experimentation.